4TH FLOOR LUXURY CONDO OVERLOOKING POOL AND HOT TUB**GREAT RATES**MAY IS BEST!!! 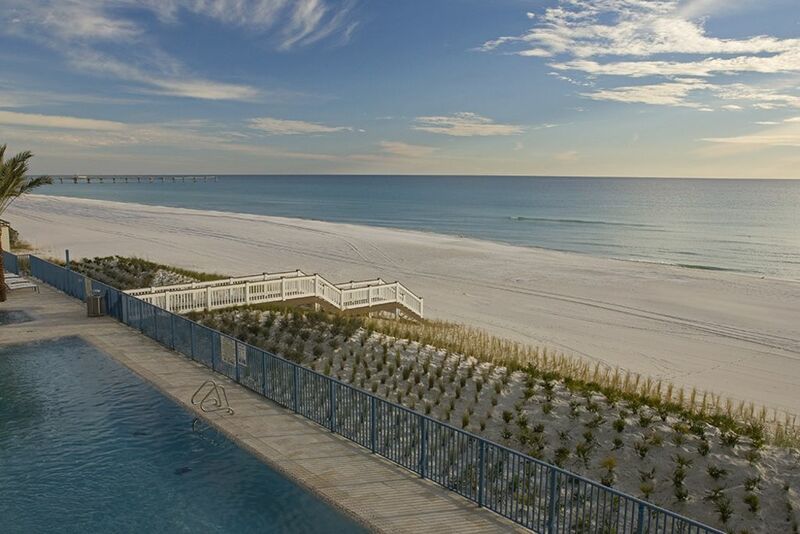 Sterling Breeze Resort is the latest new upscale condominium on the sugar white sands of Panama City Beach. Located within walking distance of Pier Park, our residence offers Gulf Front Views and Ambiance on the sun kissed shores of Panama City Beach. Sterling Breeze offers more that you ever dreamed. The lobby with its impressive granite water-feature, to the gulf-side heated pool and hot tub, fire pit, and state-of-the-art fitness center. NOTE: We have just finished custom painting through out the condo along with a new leather sofa and two chairs in the living room. Our home is fully furnished and professionally decorated with a 4th floor view that is breathtaking. Our heated tropical pool is over 2000 square feet, with a whirlpool spa and plenty of deck area to lounge around and enjoy the sun and beach. All this and only minutes away (less than 1/4 mile) from Pier Park and Mall, and the proposed International Airport less than 10 miles from Sterling Breeze Resort. NO SMOKING AND NO PETS!!!!! THE SOUTHERN/OWNER RENTAL POLICY APPLIES. *From March 1st through Labor day weekend, there is a Sterling Breeze Owner Association Concierge charge of $20 to register for each condo stay. OUR CONDO IS ON THE 4TH FLOOR! SATURDAY TO SATURDAY IN PRIME RENTAL SEASON!! We are a family from Michigan that loves the Emerald Coast of Florida. We love staying in our condo and try to visit as much as we can. Enjoy! We purchased our condo because we fell in love with Panama City Beach, 30A, Destin, and all the area has to offer. We love sharing our condo with new guests and friends. We love shopping, dining, relaxing, and the beautiful beaches in the area. All we can say is ENJOY!!!!!!!!!!!! State of the Art exercise/workout area with Gulf and pool views. Fire pit. Wine Bar with comfortable seating. * $10 Concierge charge upon registration. We enjoyed the condo, a very beautiful place to stay. We had a little problem when we rented a golf cart over night, because your not allowed to park it on the property. Thank you for taking the time to write a review. I am sorry about the golf cart parking problem. There are two parking spaces per condo in the parking garage. I am not sure if your golf cart was insured and had plates to drive on Florida streets. Thank you though for staying in our condo. It was the best stocked one that we’ve stayed in. Loved it. It was great. The most relaxing vacation ever. The condo was as advertised. Good location, well stocked. We only needed two things that it wasn’t stocked with-a dishcloth and a gallon sized pitcher. I went and bought both and left in the condo. I brought a group of high school seniors, and there was more action for them down toward Thomas Drive. This condo was perfect for families. Loved this place, Worked out great for my family. Plenty of room clean and neat. Great view of the beach. Would highly recommend. Loving winter in Florida at Sterling Breeze!!! We loved our stay at the Sterling Breeze property,this winter. We checked into our unit 406, with no problems once so ever. If we had any issues at all, Southern and Bill and Carolyn, were very attentive in taking care of everything. They all made our stay very comfortable for us. The patio outside was perfect, for sitting out relaxing and the view was awesome, looking over the gulf! We loved being able to grill, right out on our deck, definitely an added bonus. Our unit was fully stocked, with everything we needed for our winter home. We are so looking forward to returning this next winter. Thank you so much for making everything perfect for us. Thank you for the kind review. We look forward to your future stay in our condo. We try very hard along with Southern to make sure that you have a clean, comfortable, and well stocked condo for your enjoyable stay. Thank you again for your time and consideration for this review. We were very happy with our condo at Sterling Breeze #406. The condo beautifully decorated and very spacious. We loved the location so close to Pier Park and other attractions. We highly recommend this condo!!! Bay Point Golf and Yacht Club Resort access.